What is voluntary assisted dying (VAD)? Voluntary assisted dying (VAD) is a quick and peaceful death which results from a patient taking or administering to themself a fatal dose of a medication prescribed after their rational and continued request, made in order to relieve their own suffering. VAD is currently illegal in all jurisdictions across Australia. 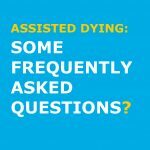 What is the difference between voluntary assisted dying and voluntary euthanasia? Voluntary Assisted Dying (VAD) and Voluntary Euthanasia (VE) are often used in common language to mean the same things. However, they are actually defined differently. The difference is that in the case of VAD, the lethal medication is self-administered, whilst in the case of VE the lethal medication is administered by someone else, usually a doctor giving a lethal injection. Currently, both Voluntary Euthanasia and Voluntary Assisted Dying are against the law across Australia. NB: The Final Report 2016 of the Victorian Parliamentary Inquiry into end of life choices recommended that a new law should be introduced allowing assistance to die by self-administration only (ie. voluntary assisted dying), with the only single exception being administration of the lethal drug by the doctor (ie. 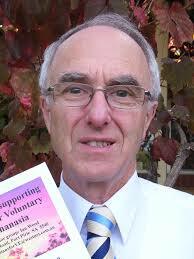 voluntary euthanasia) where the terminally-ill person is physically unable to self-administer the lethal drug. Where in the world has voluntary assisted dying been legalised? Andrew Denton produced this excellent short video (2.2 mins) to guide us through the history of voluntary assisted dying from the very first law ever passed – here, in Australia. The video was made in November 2016, just prior to the defeat of the South Australian Death with Dignity Bill and before the Washington D.C. Death with Dignity Act went into effect in February 2017. Why do we need a change in the Australian law? The current laws in all jurisdictions across Australia prohibit voluntary assisted dying (VAD). We believe the law needs to reflect the values of Australians who have compassion for those who are suffering and respect human rights. We are campaigning to change the law, and as part of this campaign we are asking politicians to reflect the values of their electorate. Following are some of the specific reasons why the current laws need to be changed. If a person is suffering unbearably at the end of life and there are no practical and acceptable means of either prolonging their life or ending their suffering, and if that person asks for help to die, then VAD should be a legal option. Palliative care provides huge benefits to patients in their last days or weeks. However, even the best palliative care cannot relieve the suffering experienced by some patients at the end of life. This can include psychological and existential suffering, as well as physical pain. Some patients at the end of life suffer unbearable symptoms such as inability to swallow, inability to talk, severe breathlessness, even choking. The Victorian Parliamentary Inquiry into end of life choices Final Report 2016 confirmed “Certain types of pain can be difficult to alleviate or cannot be controlled completely. Advances in medical practice have helped to prolong life, but for some this means an extended period of suffering”. In cases where palliative care does not relieve such suffering, VAD should be available as an option of last resort. 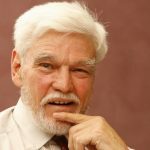 As Dr Rodney Syme said on 15 June 2017, “My argument would be that assisted dying should find a place in Australia within palliative care…It would mean that people would get the very best in palliative care leading up to their death. And then assisted dying would only become important at the ‘sharp, pointy end’ of dying – as it relates to actually having to die”. In some parts of the world (e,g. Canada and some states of the US) the courts have recognised that in such circumstances, forcing a person to suffer at the end of life is a violation of their rights under their constitutions. In February 2015 The Supreme Court of Canada, confirmed that the Canadian Bill of Rights guarantees a person’s right not to be forced to undergo “cruel and unusual punishment“, which includes having their life protracted where they are suffering unbearably. Even though Australia does not have a Charter of Rights, such as those that exist in the UK, Canada and New Zealand, the same human rights considerations implicitly apply here. Palliative or terminal sedation is a palliative care practice of gradually increasing doses of analgesics and sedatives without providing hydration until a coma is induced prior to death – with or without the consent of the patient. Once this process begins, death is inevitable but it may take several days or longer, with the result that it has been called by some people ‘slow euthanasia’. 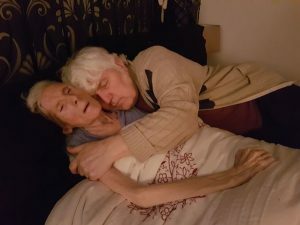 Voluntary assisted dying achieves the same outcome but is not as protracted and, because the time of death can be foreseen, the dying person can say goodbye to their loved ones in the way they want to. There is a long‑standing history of strong public support for VAD in certain circumstances. Opinion polls over the past two decades have consistently shown that a majority of Australians think VAD should be legalised. For more details please see the separate FAQ on the level of Public Opinion. Research over many years has shown that medical professionals are already helping patients to die but this is an ‘underground’ practice that is not regulated and not available equally to all who need it. Opponents of VAD will not be affected by a change in law, but those who want VAD are adversely affected by the current situation. 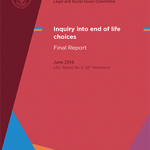 NB: The Victorian Parliamentary Inquiry into end of life choices Final Report 2016 : The methodology the Parliament of Victoria Legislative Council Legal and Social Issues Committee used in the Inquiry into end of life choices (2015 to 2016), including examination of submission and hearing evidence and academic research, allowed it to identify the arguments that were most commonly put forward in the voluntary assisted dying debate. These arguments were repeated, to varying degrees, by academics, health practitioners, religious and faith‑based organisations, and individuals. Radio 2SER ‘Razor’s Edge’ Producer, Monica Samayoa, interviewed our DWD NSW Vice President, Shayne Higson, about the limitations of the current end-of-life options and why a voluntary assisted dying law would help reduce the suffering that some people now experience. ‘Razor’s Edge’ have published the short audio of this informative interview (7.58 mins) – click here to listen. Why isn’t palliative care enough at end-of-life? Palliative care in Australia is amongst the best in the world, so most Australians die well, however, even Palliative Care Australia acknowledges that: “It cannot relieve all pain and suffering, even with optimal care.” This can include psychological and existential suffering, as well as physical pain. Flora and Tom Lormier. 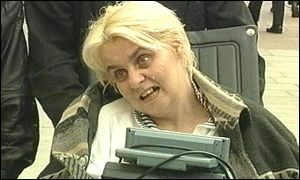 Multiple Sclerosis ravaged Flora’s body and she begged to be helped to die. Some patients at the end of life suffer unbearable symptoms such as inability to swallow, inability to talk, severe breathlessness, choking, weakness, incontinence, severe constipation, agitation, insomnia, ulceration, discharge and odour. Suffering encompasses much more than just pain; loss of autonomy, being less able to engage in enjoyable activities and loss of dignity can deeply affect those at the end of their lives, but cannot necessarily be relieved by palliative care. 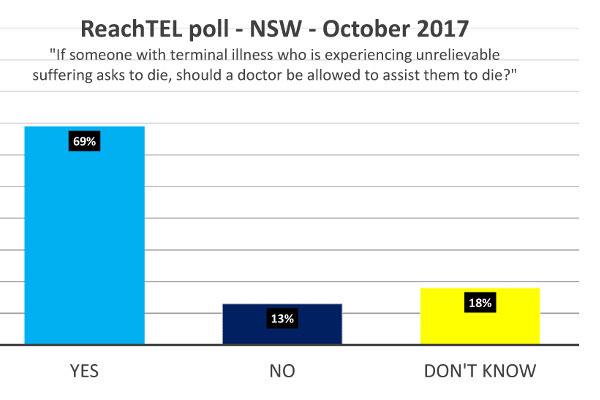 In addition, opinion polls confirm that many Australians would prefer to die at home, surrounded by their loved ones, and this is often not possible when a patient is receiving medical treatment. In cases where palliative care does not relieve such suffering, assistance to die should be available as an option of last resort, decided upon by both the patient and their doctors, when all other treatments and palliative care options have failed. Following is a short video made by past President of the World Federation of Right To Die Societies, Neil Francis, at the time of the 2013 South Australian bill, to explain how even the best palliative care can’t always relieve intolerable suffering at the end of life. Scientific opinion polls have been conducted in Australia for decades. Support for assisted dying law reform reached a majority at least by the 1970s. In the 1980s it was a significant majority. By the 1990s, support had increased into the mid to high seventy percentage. In four polls through the 1990s the positive response was 76 to 78%. In 2002 a Morgan poll showed national support at 73%. In a poll conducted by Essential Research in August 2017 of 1000 Australians, respondants were asked: “If someone with a terminal illness who is experiencing unrelievable suffering asks to die, should a doctor be allowed to assist them to die?” 73% of respondants said yes, with only 15% of those polled disagreeing with the proposition, while a further 12% were undecided. These results were similar to Essential Media poll results over the last six years. The 2017 poll showed very strong public support amongst individuals from all political persuasions, including Liberal National voters (70%), Labor voters (78%) and Greens voters (80%). Amongst respondents aged 55 years and over, support for assisted dying was particularly strong, with 81% stating that they believed that doctors should be able to assist, and just 10% disagreeing. These results are comparable with other Australian research, such as a 2010 The Australia Institute (TAI) survey, which surveyed 1,294 Australians. TAI asking “If someone with a terminal illness who is experiencing unrelievable suffering asks to die, should a doctor be allowed to assist them to die? An overwhelming 75% said yes, just 13% said no, and 12% were undecided. The Vote Compass survey conducted around the NSW 2015 Election found that a total of 72% of people from NSW strongly agreed or agreed with the proposition, compared with 16% of respondents who did not and 11% who said they were neutral. The findings were based on more than 34,000 respondents to the same statement: “Terminally ill patients should be able to legally end their own lives with medical assistance”. The support for voluntary assisted dying crossed party lines; the majority of Greens voters (86%), three quarters of Labor voters (75%), and a little more than two thirds of Coalition voters (69 %) were in favour. It had the highest backing from people over 55 years of age. What about the opinion of the Australian public who are currently suffering, or have suffered, from breast cancer? In 2017 more than 10,000 Australians who were living with, or survivors of, breast cancer contributed to a broad ranging survey commissioned by Breast Cancer Network Australia. Seventy five per cent of respondents said they were supportive of people having access to medically assisted dying. The survey also showed the longer someone had been living with metastatic cancer the more supportive they were of assisted dying, with 96 per cent of women who had been living with metastatic breast cancer for five or more years in favour of legal change. Click for details. What happens in countries that have assisted dying laws? The ‘Oregon model’ – since 1997 – this is broadly the model that has operated in Oregon since 1997, without change, and is the model envisaged by other countries and other US states that are contemplating assisted dying legislation, such as New Zealand, Ireland, the UK and various other states of the US. This is the model (again with some variations) which is being pursued in Australia. The ‘Benelux’ model – since 2002 – this is the model followed in the Netherlands, Belgium and Luxembourg. Other countries around the world that are looking at assisted dying laws do not intend to use this model. Switzerland – since 1942 – a unique case. Following is more information about each of these models. The Death with Dignity Act (DWDA) began operation in 1997. It allows terminally ill Oregon residents to obtain and use prescriptions from their physicians for self-administered, lethal medications. Under the Act, ending one’s life in accordance with the law does not constitute suicide. The DWDA specifically prohibits euthanasia, where a physician or other person directly administers a medication to end another’s life. Diagnosed with a terminal illness that will lead to death within six months. To comply with the law, physicians must report to the Department of Human Services (DHS) all prescriptions for lethal medications. Reporting is not required if patients begin the request process but never receive a prescription. In 1999, the Oregon legislature added a requirement that pharmacists must be informed of the prescribed medication’s intended use. Physicians and patients who adhere to the requirements of the Act are protected from criminal prosecution, and the choice of DWDA cannot affect the status of a patient’s health or life insurance policies. The Oregon Revised Statutes specify that action taken in accordance with the DWDA does not constitute suicide, mercy killing or homicide under the law. Physicians, pharmacists, and health care systems are under no obligation to participate in the DWDA. The operation of the law in Oregon is closely monitored by the Health Department, as well as by academic research and has operated without abuse since its introduction. It is reported that about 40% of patients who have been prescribed a lethal dose do not end up using it because they find the possession of it provides reassurance which has a palliative effect. 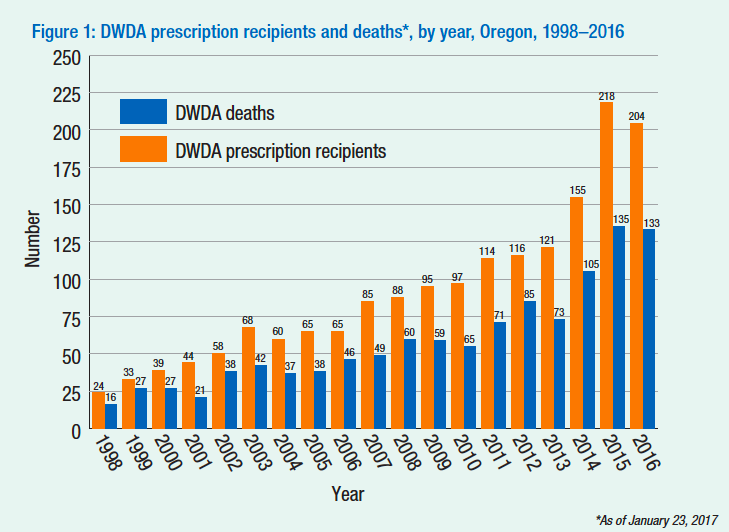 Between the passage of the law in 1997 and 2016, a total of 1545 people were written prescriptions under the DWDA in Oregon, and 991 patients died from ingesting the lethal medications. The majority of the patients had cancer and were elderly, white, and well-educated. Almost all patients were in palliative care, and almost all took the medications at home after telling loved ones of their decision. It is also reported that it is relatively rare for patients to apply for assistance under the DWDA because they were suffering from inadequate pain palliation. The most common reasons were related to quality of life, autonomy, and dignity. to safeguard, monitor and promote the care with which medical decisions about termination of life on request are taken and the quality of such decisions by bringing matters into the open and applying uniform criteria in assessing every case in which a doctor terminates life. Euthanasia remains a criminal offence. However, both voluntary euthanasia and voluntary assisted dying are not punishable if the attending physician acts in accordance with statutory due care criteria (below). The patient has no ‘right to euthanasia’ and doctors are not obliged to comply with requests for euthanasia. The patient has to go through an application process for voluntary euthanasia and voluntary assisted dying. Voluntary euthanasia and voluntary assisted dying are supported by the Royal Dutch Medical Association. 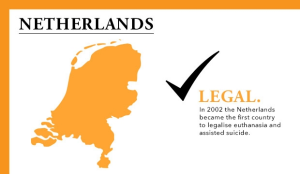 There is general support in the Dutch community for voluntary euthanasia. Because of the stringent conditions it is not legally possible for non-residents of the Netherlands to request euthanasia. exercise due medical care and attention in terminating the patient’s life or assisting in his/her death. Only once all these criteria have been fulfilled may the physician proceed to perform voluntary euthanasia or assist the patient to die. In the Netherlands voluntary assisted dying is available to minors. Patients between 12 and 15 years of age require the consent of their parents to make a request; patients aged 16 and 17 can make a request but the parents have to be involved in the discussions. 80% of patients in this age group are cancer patients. The Act requires physicians to report assisted deaths to the municipal coroner, who then sends a report to the Public Prosecutor. The relevant regional voluntary euthanasia review committee (comprising a doctor, lawyer and ethicist) receives both these reports. If the statutory due care criteria are met, the review committee will close the case; if not met, the review committee will notify the Public Prosecutor and Health Inspectorate. These bodies will decide if action against the doctor will be taken. 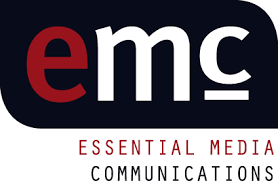 In 2018 the Swiss Academy of Medical Sciences issued new guidelines that make assisted dying a normal part of doctors’ medical responsibilities – see 6.2.1 Assisted Suicide and the Glossary of SAM – Swiss Guidelines on management of dying and death (2018). 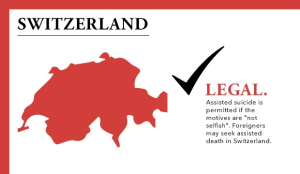 Could I go to Switzerland to have an assisted death? While we do not know how many Australians travel to Switzerland to end their lives, anecdotally we believe a small but increasing number are pursuing this option. Since 2012 Dignitas has provided VAD to just over 200 people per year. DIGNITAS – is the most prominent Swiss organisation providing VAD to foreigners. It was founded in May 1998 with the aim of allowing non-Swiss individuals access to the proven Swiss model of freedom of choice, self-determination and personal responsibility at life’s end. A German arm of this group was established in 2005. DIGNITAS’ activities go beyond accompanied suicide, with a large part of their work being counselling of persons – mostly from abroad – who get in touch with them in writing or by telephone for a variety of reasons. Lifecircle started in 2011 and offers VAD to foreigners and people living in Switzerland. EXIT (Deutsche Schweiz) started in 1982 and provides VAD to Swiss citizens only. It is not related to EXIT International founded by Philip Nitschke. • The approval process is very lengthy, with a Swiss physician having to review the formal request to ensure that assisting the applicant’s death would meet with Swiss guidelines. The request must include a letter explaining the person’s wish to die and full medical reports showing the diagnosis and treatments that have already been tried. • The assessment requires two personal discussions between the physician and the person making the request. 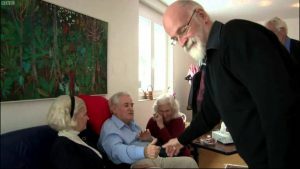 Consequently, the application must plan to stay in Switzerland for 3 or 4 days to attend these meetings before they have their assisted death. • The cost of about $15,000 plus airfare and accommodation is prohibitive for many people. • The long journey from Australia could be very difficult, especially if the person is at a stage where they are in great pain and distress. • People often choose to die earlier than necessary due to fear that they will not be able to make the journey when they are very sick. • Anyone who accompanies the person overseas to have VAD could be charged with assisting a suicide and be liable to imprisonment in Australia upon their return. Terry Pratchett says goodbye to Peter Smedley just before his assisted death at Dignitas in 2010 – screenshot from ‘Choosing to Die’ (2011). For an insight into the process of having an assisted death in Switzerland see “Terry Pratchett: Choosing to Die” released in 2011. The 59 minute television documentary, directed and produced by Charlie Russell for BBC Scotland, is presented by English author, Sir Terence Pratchett OBE (who died in 2015). It features Peter Smedley, a 71-year-old motor neurone disease sufferer from England, having an assisted death at Dignitas in Switzerland. Opponents of voluntary assisted dying often say that if legislation is passed to allow terminally ill, mentally competent adults who are suffering unbearably to receive help to die, it is only a matter of time before that option is extended to other more vulnerable groups. They call this the ‘slippery slope’ and contend that the law would eventually include the mentally ill, children, those with dementia, and those who are merely tired of life. No. 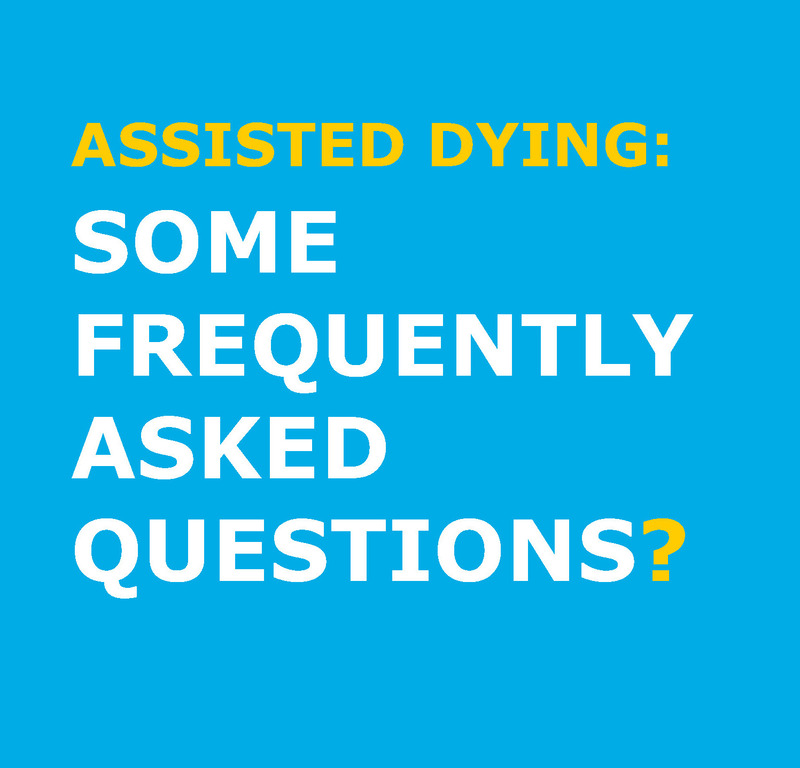 Assisted dying regimes have to be legislated, so there is no way that an extension of the eligible categories could occur unless the existing law was amended by the Parliament. In all the Australian states in which assisted dying bills have been introduced into Parliament, they have uniformly envisaged that only mentally competent adults with a terminal illness and experiencing unbearable suffering would be eligible to receive medical assistance to die. All bills propose strict monitoring and reporting requirements to ensure that no unlawful acts of assisted dying take place. Without a change in the law, there is no possibility that an unscrupulous doctor could assist non-eligible people to die. In those jurisdictions where some form of assisted dying is legal, there has been a great deal of official monitoring of the operation of the law, as well as numerous academic studies. Over the last decade, numerous, wide-ranging, official inquiries into these laws have rejected allegations of the ‘slippery slope’. It is notable that very few of the commentators who have articulated the above concerns have actually acknowledged this evidence. Most recently, a cross-party Victorian parliamentary inquiry. In its June 2016 report, handed down after 10 months of investigation, they found “rigorous safeguards, monitoring procedures and high levels of compliance” and “no evidence of institutional corrosion or the often cited ‘slippery slope’”. 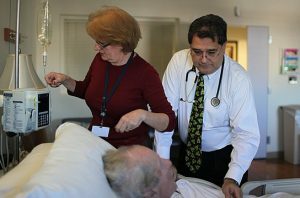 In the USA, access to voluntary euthanasia is restricted to people with a terminal illness and 6 months or less to live. In 20 years of operation this law has never changed. 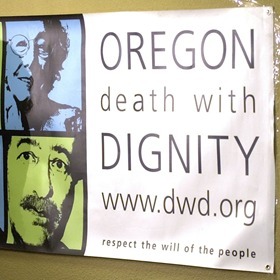 The Oregon Health Authority is required to collect compliance information on the use of the Dying With Dignity Act and to issue an annual report. Its 2016 Report stated that in 2016 133 people had dies from ingesting prescribed lethal medications. This constitutes about 0.2% of all deaths in Oregon. Characteristics of patients were similar to previous years; most patients were aged 65 years or older (80.5%) and had cancer (79%). During 2016 no referrals were made to the Oregon Medical Board for failure to comply with the requirements of the law. Click for full details. Often opponents refer to the European laws, especially in Belgium and The Netherlands, to suggest that laws written to apply only to the terminally ill have since been broadened to provide access to those without terminal illness. This is incorrect – the laws in Europe were never written purely for the terminally ill, but for those with a ‘medically futile condition that causes unbearable suffering’. The overwhelming majority of people who use these laws have cancer, but they also allow people with degenerative and chronic illnesses, such as Motor Neurone Disease, Multiple Sclerosis, and Chronic Rheumatoid Arthritis, to ask for help to die. In very rare instances, people with long-term and extreme psychiatric suffering have also been helped. All of this is consistent with how the laws in Europe were written. In The Netherlands, there were 5,516 reported cases of assisted dying in 2015, with 208 cases of patient self-administration and 5,277 cases of doctor administration. This is an overall increase of 4.0% on the 2014 figures (5,306 total cases). Assisted deaths represented 3.9% of all Dutch deaths in 2015 and the vast majority of patients who opted for an assisted death were suffering from cancer (70%). Of the 5,516 assisted dying cases reported in 2015, 4 were judged by the Euthanasia Committees as not meeting all necessary due care criteria: a compliance rate of 99.93% . Click for full details. 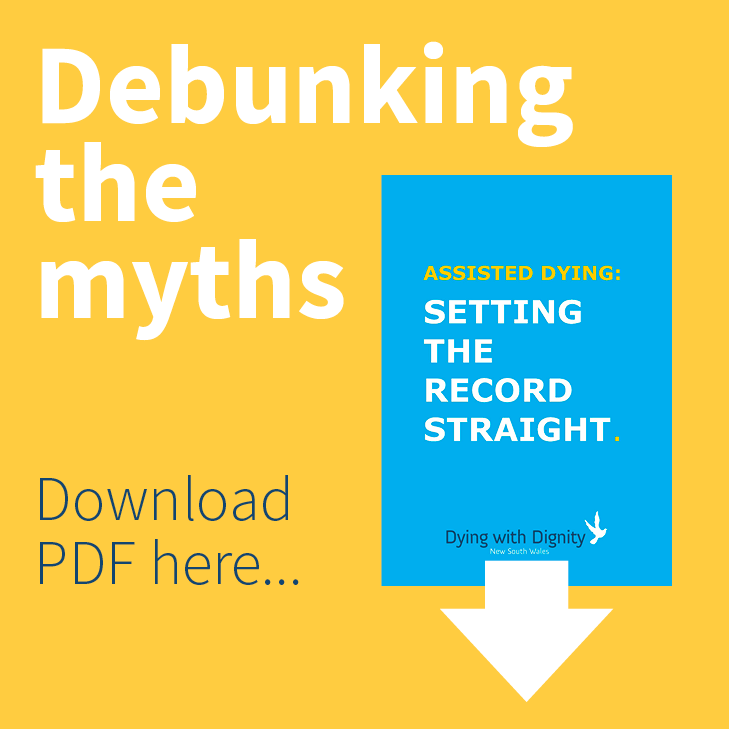 Neil Francis’s Dying for Choice website provides a lot of information which rebuts some commonly held misconceptions about what happens in places which permit assisted dying. Click for this website. Would legalising VAD make aged people vulnerable to coercion? Opponents of voluntary assisted dying suggest that if legislation is passed, it would encourage members of some vulnerable groups, such as the frail and aged, to feel that their lives are of less value and they ought to take the option of an assisted death. The fear is that such people might make this decision because they feel they are a burden on their carers or, worse, that they would feel pressured by unscrupulous relatives who want to access an inheritance sooner. 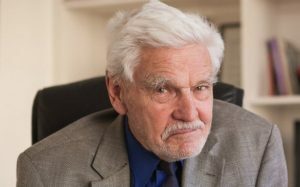 Worse still is the fear, that the frail and aged would feel pressured by the Australian health system to opt out and relieve the demand on the limited health care budget. No. Voluntary assisted dying laws come with strict eligibility criteria and strong safeguards to ensure they apply only to those for whom the law is written. To qualify a person has to have to have an extreme medical condition which, in the assessment of two doctors, independent of each other, is clearly leading to their death and which can no longer be treated in a way that will meaningfully ease their suffering. There is far more involved in the decision than a patient merely requesting it. The opinion of medical professionals that the patient’s condition meets strict criteria is required. Failure by doctors to follow the law means they risk losing their license or going to gaol. 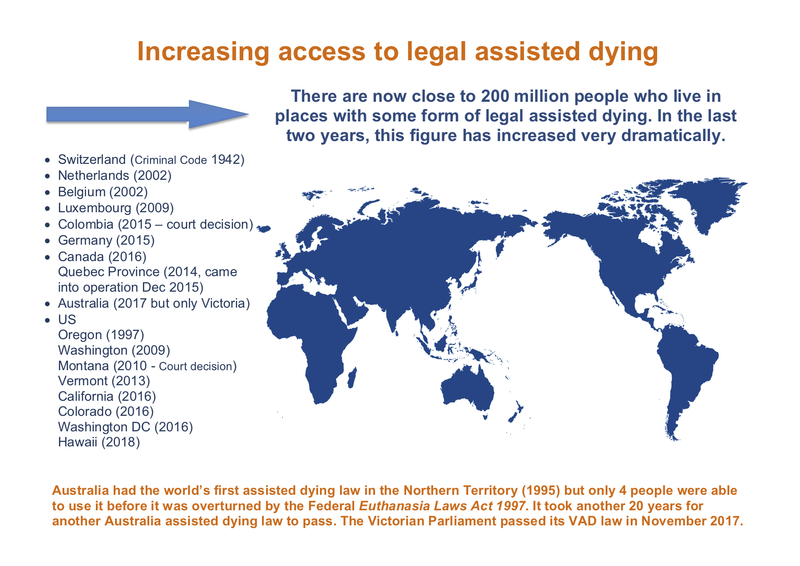 As with the slippery slope argument, research in jurisdictions where voluntary assisted dying is legal demonstrates no evidence of elder abuse as a result of these laws, a fact confirmed by leading elderly rights groups in those countries. Would legalising VAD place people with disabilities at risk? Opponents of voluntary assisted dying that if legislation is passed, it would encourage members of some vulnerable groups, such as people with disabilities, to feel that their lives are of less value and they ought to take the option of an assisted death. No. Voluntary assisted laws come with strict eligibility criteria and strong safeguards to ensure they apply only to those for whom the law is written. To qualify a person has to have to have an extreme medical condition which, in the assessment of two doctors, independent of each other, is clearly leading to their death and which can no longer be treated in a way that will meaningfully ease their suffering. Disability, on its own, does not make a person eligible under this law. There is also another argument that providing terminally-ill people with a disability with the assistance to die helps to counteract the current discrimination. Currently, people without disabilities generally have the physical ability to commit suicide, while the physical circumstances of others may prevent them from doing so. Because of her disease, Dianne Pretty was unable to end her own life. She sought an undertaking from the Director of Public Prosecutions not to prosecute her husband if he assisted her to commit suicide, as the latter was a criminal offence under English law. The Director refused. See “Issues Paper: Euthanasia, human rights and the law” (2016) produced by the Australian Human Rights Commission for a discussion of this case. Would legalising VAD place children at risk? This is part of the slippery slope argument by opponents of voluntary assisted dying, that if voluntary assisted dying legislation for adults is passed, it is only a matter of time before that option is extended to other more vulnerable groups, such as children. Opponents often refer to Belgium, which does have legislation allowing a child to make a request for assistance to die. No. Belgium is the only jurisdiction in the world that has a voluntary assisted dying law which applies to children. However, this law carries even greater safeguards, and stricter criteria, than the already strict laws relating to adults – the child must be in a ‘medically futile condition’, experiencing constant and unbearable suffering that cannot be alleviated, and along with two doctors, a child psychiatrist has to confirm that the child knows what they are requesting. The child’s parents must also participate in, and approve of, the request. Passed into law by a two-thirds majority of the Belgian parliament, this is a recognition that even children can die from illnesses which, in spite of the best treatment, cause terrible suffering. To date, the law in Belgium has only been used once. All the laws being proposed in Australia apply only to adults. Would legalising VAD encourage suicide? This argument is known as suicide contagion. It suggests that the legalisation of voluntary assisted dying will lead to an increase in suicides, because it devalues life generally. No. Suicide is entirely distinct from voluntary assisted dying. Suicide is an irrational impulse, acted on in secret, in response to a problem that, with treatment, could most likely be fixed. Voluntary assisted dying is a rational response, taken in consultation with doctors and family, to a condition of suffering that cannot be fixed. This difference was clearly understood by the Chief New York medical examiner, Charles Hirsch, when investigating the deaths of office workers who jumped from the World Trade Centre on 11 September 2001. Faced with a terrible choice – a slow, agonizing death by fire, or a quick death by jumping – many chose to jump. Seeing this as a rational choice to avoid needless suffering, Hirsch refused to classify their deaths as ‘suicides’. There is no credible evidence of increased suicide rates as a result of assisted dying laws overseas. Would legalising VAD lead to reduced spending on palliative care? Opponents of voluntary assisted dying have argued that legalising this choice would lead to reduced spending by governments on palliative care, because death would be seen as a cheaper option. No. There is no evidence of this having occurred in any jurisdictions where assisted dying has been legalised. In fact, the opposite appears to be true. For example, palliative care in Oregon is excellent and voluntary assisted dying is not seen a replacement for good palliative care. 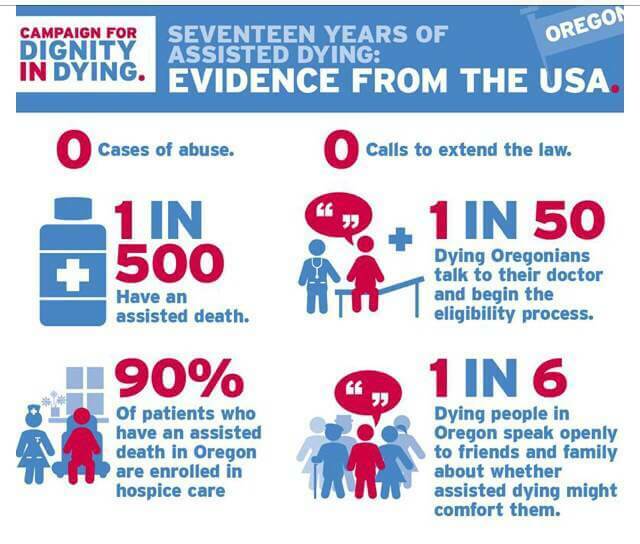 Evidence shows that 90% of people who had an assisted death in Oregon were enrolled in hospice care, compared to the national average for the USA as a whole of 45%. 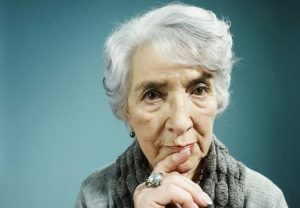 A scientific study just published in the New England Journal of Medicine reveals that residents of both Oregon and Washington states, which legalised assisted dying in 1997 and 2008 respectively—as well as establishing formal advance directive programs—are far more likely to experience the kind of death they prefer, and with better access to palliative care, than is the average USA resident. 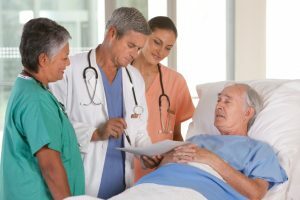 These results mirror another US report from the Journal of Palliative Medicine which placed both Oregon and Washington amongst the top eight states for palliative care access in hospital settings. This study furthers these insights by showing that access to palliative care services in home settings is also significantly higher than the national average in Oregon and Washington. Click to read the full article. Is voluntary assisted dying incompatible with religious belief? Many Christians believe that voluntary assisted dying, is consistent with Christian values and with Jesus’ message of love and compassion, especially for those who are suffering or less fortunate than ourselves. The Australian organisation, Christians Supporting Choice for Voluntary Euthanasia, has an excellent web site which sets out the arguments and closely examines Christian doctrine in relation to this question. Click for their website. Do religious people support voluntary assisted dying? Today the overwhelming majority of Australian Christians support choice for voluntary assisted dying. A number of studies have confirmed that whilst support for voluntary assisted dying is strongest amoungst those who say they have no religion, the vast majority of religious Australians are also supporters. For example, the 2016 Australian Election Study (AES), conducted by scholars at Australian National University, which found support for the statement the statement that “Terminally ill people should be able to legally end their own lives with medical assistance” by 74.3% of Catholics and 79.4% of Anglicans, 77.8% of Uniting Church and 90.6% with no religion. 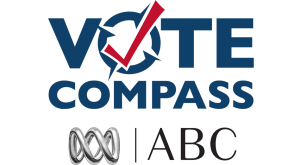 The ABC Vote Compass policy tool used for the 2013 Federal election found that out of 1.4 million Australians, 75% supported the statement that “Terminally ill people should be able to legally end their own lives with medical assistance”. 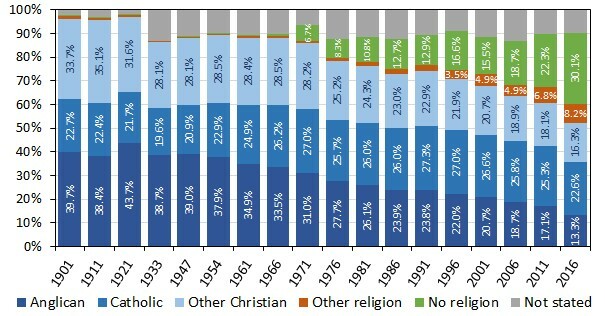 The breakdown based on religion showed support from 69.8% of Catholic respondents, 67.8% of Protestant, 75.9% of Uniting Church and 77.7% of those from other religions and 90.1% from those with no religion. Similarly, a 2012 national Newspoll survey asked “Thinking now about voluntary euthanasia, if a hopelessly ill patient, experiencing unrelievable suffering, with absolutely no chance of recovery asks for a lethal dose, should a doctor be allowed to provide a lethal dose”. 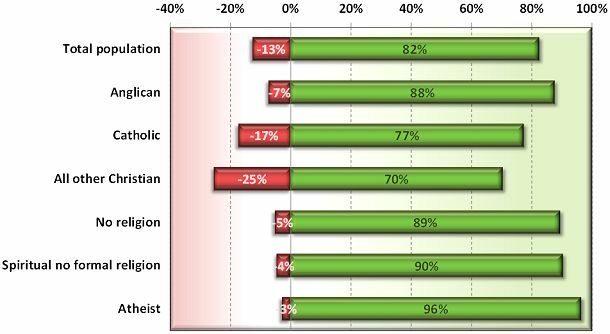 The results showed support by 77% of Catholics, 88% of Anglicans and 70% of respondents from other Christian religions. The Catholic Church and members of the clergy who publicly oppose voluntary assisted dying are not representing the view of their “flock”. Why do religious people support voluntary assisted dying? Canon Rosie Harper, a leading British Church of England priest has spoken out in favour of changing the law to allow voluntary assisted dying and explained why this is compatible with her faith. 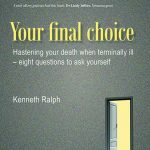 Another good source is the very thoughtful book by Kenneth Ralph, Your Final Choice. In Chapters 5, 6 and 7, Ralph looks at some of the arguments Christians use to argue against assisted dying, and concludes: “none should be required to hasten their death, but all should be free to do so”. Click for publisher’s website. Christians have always been active in the modern campaign for voluntary assisted dying law reform. For example, among the founders of the American Euthanasia Society, in 1945, were prominent Christians. Assisted dying is not accepted within the Muslim faith. Click for more on this topic. What is the stance of Australian doctors on assisted dying? Research has consistently shown that doctors are divided on the issue of assisted dying. A poll of 1800 doctors conducted by the Herald Sun in 2008 asked the question “Should laws be changed so that terminally ill patients can end their lives?” and reported that 45% answered ‘yes’ and 44% ‘no’. Many doctors have expressed concern about the current lack of clarity in relation to the law regarding the so-called ‘doctrine of double effect’, namely, the situation where doctors administer a drug with the aim of alleviating pain, but which has the effect of hastening the patient’s death. They call for legislation that will bring greater protection for both doctors and patients. NB: It is estimated that in 2017 the AMA represents 30% of Australian doctors. There are well over 100 doctors whose names appear of the Drs4AD’s website, as being in favour of professional body neutrality and law reform for voluntary assisted dying under defined conditions. In May 2016 the Royal Australian College of Physicians established a Working Party to examine the issue of voluntary assisted dying. It intends to report back to the College with recommendations within twelve months. Recently, some Australian doctors have lent their support to the campaign for assisted dying being run by Go Gentle Australia. Does the 'Hippocratic Oath' prevent doctors from assisting people to die? The bottom-line answer is that both the ‘Hippocratic Oath’ and the ‘Declaration of Geneva’ do not constitute an absolute prohibition on voluntary assisted dying. The injunction to ‘do no harm’ can include not allowing a patient to endure unbearable and futile suffering and thus lead to a acknowledgement of a moral imperative to provide her/him with a peaceful death if this is requested. 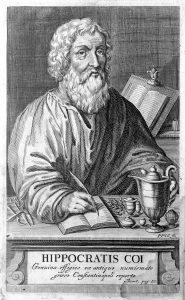 Hippocrates, born about 460 BC, lived in an era when there were no medical schools and no medical profession as we now know it. Although his oath laid the foundation for the ethical ideals to which contemporary medical practitioners should aspire, its detailed wording, relevant to social conditions prevailing 2400 years ago, are not appropriate to the practice of modern medicine. Consequently few, if any, current medical schools require their students to take the original form of the ‘Hippocratic Oath’. The oaths required by various medical schools vary from none at all, to edited statements which reveal their historic origins, to modern statements that bear no resemblance to the original ‘Hippocratic Oath’. This statement is currently in use by many Australian medical schools, such as the Faculty of Medicine, Adelaide University. With this type of oath the permissability of voluntary assisted dying hinges on how the doctor’s conscience interprets ‘the laws of humanity’. While demanding the highest ethical standards, such an oath does not rule out the possibility of circumstances arising in which requested help to a hastened death may rightly be given. What is the stance of Australian nurses on assisted dying? The NSW Nurses and Midwives’ Association (NSWNMA) re-endorsed their Position Statement on Voluntary Euthanasia in 2013 – it is not a clear statement of support, although the policy “acknowledges and supports the right of individuals to self-determination.” Click here for full statement. It is hoped that at their National Conference in July 2017 the NSWNMA will pass a motion to endorse the stronger position statement of The Australian Nursing and Midwifery Federation. Other Nursing organisations such as the Australian College of Nursing and the Australian College of Mental Health do not have an official position. A similar survey of 1000 NSW Nurses’ Association members was carried out by J. Iliffe in 1997 (with a return rate of 47.5%) with 80% supporting legalising voluntary euthanasia – Click for journal article . 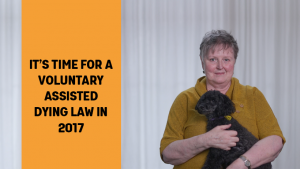 In June 2017, market research company Ekas conducted a survey of 100 nurses in NSW and found support running at 80 per cent in favour of the law reform for voluntary assisted dying, with opposition at fewer than 10 per cent. 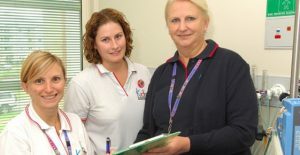 Jen Barnes, from South Gippsland, has been a nurse for 40 years and is dying from an aggressive form of brain cancer. 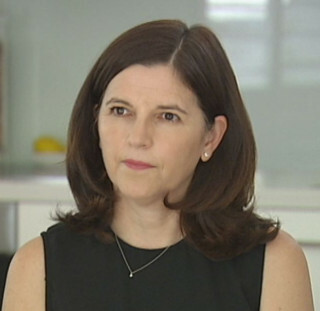 She is fronting a new voluntary assisted dying campaign, “Stop Victorians Suffering”, backed by Andrew Denton’s Go Gentle Australia organisation. Click to watch video (4.21 min). Does the ‘doctrine of double effect’ apply to assisted dying? The ‘doctrine of double effect’ comes from an ethical rule developed by Roman Catholic moral theologians in the Middle Ages. The rule makes intention in the mind of the doctor a crucial factor in judging the moral correctness of the doctor’s action because of the Roman Catholic teaching that it is never permissible to ‘intend’ the death of an ‘innocent person’. The effect of the doctrine is that if a doctor is tending to someone who cannot be restored to health, the doctor can give the patient medication which may have the unintended consequence of helping them die more quickly, provided that the doctor’s actual intention is to ease suffering. What the doctor must not do is give them medication with the intention of helping them die – even if only death will end their suffering. Based upon this doctrine, it is not unlawful for medical professionals to administer ‘continuous terminal sedation’ to a patient even though that might hasten their death, provided the primary intention is only to relieve suffering and not to bring about death. This doctrine protects doctors where they are charged with hastening the death of patients. Opponents of a change in the law often argue that ‘doctrine of double effect’ is working well, enabling people to get relief from suffering, without the doctor being exposed to a criminal charge for murder. There are many people who regard the ‘doctrine of double effect’ as seriously flawed, and assert that it cannot replace good assisted dying legislation, which would clearly states the rights and responsibilities of the treating health professional, with safeguards to protect the patient. They argue that the ‘doctrine of double effect’ takes no account of the wishes of the patient, that the doctor’s intentions cannot be realistically analysed in terms of the presence or absence of one clear purpose, and that the rule is not consistently applied. According to this perspective, the patient’s treatment and level of suffering at the end of life depends upon the thoughts and values of the individual doctor, and often whether the palliative care facility or hospital where the treatment occurs is religiously-based, or not. Without voluntary assisted dying legislation, access to treatment at end-of-life is not universally available and is a matter of good luck or money. Is it illegal to commit suicide in Australia? No. Both suicide and attempted suicide are not against the law in Australia. Is palliative sedation a form of assisted dying? Whilst some people describe ‘deep continuous pallative sedation’, also known as ‘terminal sedation’ as a slow form of euthanasia, it is considered to be a lawful treatment of last resort, as part of the suite of palliative care options. Even though the use of terminal sedation may hasten the patient’s death, and does indeed usually end with the patient’s death, it is not considered unlawful, provided the treating doctor’s primary intention is only to relieve suffering and not to bring about death. Ian Wood, (pictured) the National Co-ordinator and Spokesperson for Christians Supporting Choice for Voluntary Euthanasia, explains that terminal sedation is accepted by the medical profession and the Catholic Church as an appropriate and religiously ethical last resort, provided the stated intention of the doctor is ‘to relieve suffering’. This is based on the ethics which are deemed to underlie the ‘doctrine of double effect’. Ian Wood observes that where a person dies by terminal sedation, there are no additional reporting requirements, death is recorded as being due to the underlying illness and the patient may not even be asked for their consent to the procedure. Conversely, if the dying patient requested that “Rather than starve me to death in a coma, with the trauma of having my family watch this slow death, please give me a single lethal dose containing the total quantity of medication that you would need to keep me sedated over the next few days”, this would be illegal. “As Christians we ask why is it morally acceptable that the slow death procedure is legal, but not the quick alternative proposed in this example?” concludes Ian Wood. Nevertheless, whilst voluntary assisted dying is currently illegal in Australia, continuous terminal sedation is not. Does my doctor have the right to continue medical treatment that I don’t want? Every competent adult has the right to refuse medical treatment, including artificial feeding, hydration and respiration, even if this will hasten death. It is not unlawful for a health professional to cease or withdraw life-saving treatment if that is what the competent patient, or their nominated Enduring Guardian, requests. Does my doctor have the right to withdraw medical treatment that I want? In Australia, health professionals have no duty to provide medical treatment that is futile. Health professionals are required by law to use care and skill in determining which treatments are in their patients’ best interests. There is no obligation under Australian common law for a health professional to obtain a patient’s consent, or the consent of his or her next of kin, or authorisation from any other source (such as a court, tribunal or statute) before making the decision to discontinue futile treatment. The Australian Centre for Health Law at the Queensland University of Technology has established an excellent website which explains the legal issues around end-of-life-care and decision-making. We encourage you to visit this site for reliable and up to date information – Click here for their website.